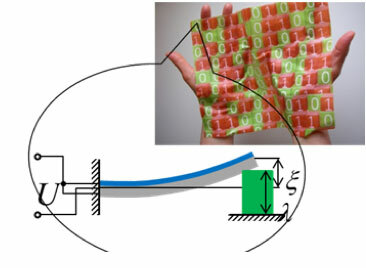 (Nanowerk News) Moving closer to the possibility of "materials that compute" and wearing your computer on your sleeve, researchers at the University of Pittsburgh Swanson School of Engineering have designed a responsive hybrid material that is fueled by an oscillatory chemical reaction and can perform computations based on changes in the environment or movement, and potentially even respond to human vital signs. The material system is sufficiently small and flexible that it could ultimately be integrated into a fabric or introduced as an inset into a shoe. Anna C. Balazs, Ph.D., distinguished professor of chemical and petroleum engineering, and Steven P. Levitan, Ph.D., John A. Jurenko professor of electrical and computer engineering, integrated models for self-oscillating polymer gels and piezoelectric micro-electric-mechanical systems to devise a new reactive material system capable of performing computations without external energy inputs, amplification or computer mediation. Their research, "Achieving synchronization with active hybrid materials: Coupling self-oscillating gels and piezoelectric (PZ) films", appeared June 24th in the journal Scientific Reports. The studies combine Balazs' research in Belousov-Zhabotinsky (BZ) gels, a substance that oscillates in the absence of external stimuli, and Levitan's expertise in computational modeling and oscillator-based computing systems. By working with Dr. Victor V. Yashin, research assistant professor of chemical and petroleum engineering and lead author on the paper, the researchers developed design rules for creating a hybrid "BZ-PZ" material. "The BZ reaction drives the periodic oxidation and reduction of a metal catalyst that is anchored to the gel; this, in turn, makes the gel swell and shrink. We put a thin piezoelectric (PZ) cantilever over the gel so that when the PZ is bent by the oscillating gel, it generates an electric potential (voltage). Conversely, an electric potential applied to the PZ cantilever causes it to bend," said Balazs. "So, when a single BZ-PZ unit is wired to another such unit, the expansion of the oscillating BZ gel in the first unit deflects the piezoelectric cantilever, which produces an electrical voltage. The generated voltage in turn causes a deflection of the cantilever in the second unit; this deflection imposes a force on the underlying BZ gel that modifies its oscillations. The resulting "see-saw-like" oscillation permits communication and an exchange of information between the units. Multiple BZ-PZ units can be connected in serial or parallel, allowing more complicated patterns of oscillation to be generated and stored in the system. In effect, these different oscillatory patterns form a type of "memory," allowing the material to be used for computation. Levitan adds, however, the computations would not be general purpose, but rather specific to pattern-matching and recognition, or other non-Boolean operations. "Imagine a group of organ pipes, and each is a different chord. When you introduce a new chord, one resonates with that particular pattern," Levitan said. "Similarly, let's say you have an array of oscillators and they each have an oscillating pattern. Each set of oscillators would reflect a particular pattern. Then you introduce a new external input pattern, say from a touch or a heartbeat. The materials themselves recognize the pattern and respond accordingly, thereby performing the actual computing." Developing so-called "materials that compute" addresses limitations inherent to the systems currently used by researchers to perform either chemical computing or oscillator-based computing. Chemical computing systems are limited by both the lack of an internal power system and the rate of diffusion as the chemical waves spread throughout the system, enabling only local coupling. Further, oscillator-based computing has not been translated into a potentially wearable material. The hybrid BZ-PZ model, which has never been proposed previously, solves these problems and points to the potential of designing synthetic material systems that are self-powered. Balazs and Levitan note that the current BZ-PZ gel model oscillates in periods of tens of seconds, which would allow for simple non-Boolean operations or pattern recognition of patterns like human movement. The next step for Drs. Balazs and Levitan is to add an input layer for the pattern recognition, something that has been accomplished in other technologies but will be applied to self-oscillating gels and piezoelectric films for the first time.